What was it I was supposed to be blogging about again? 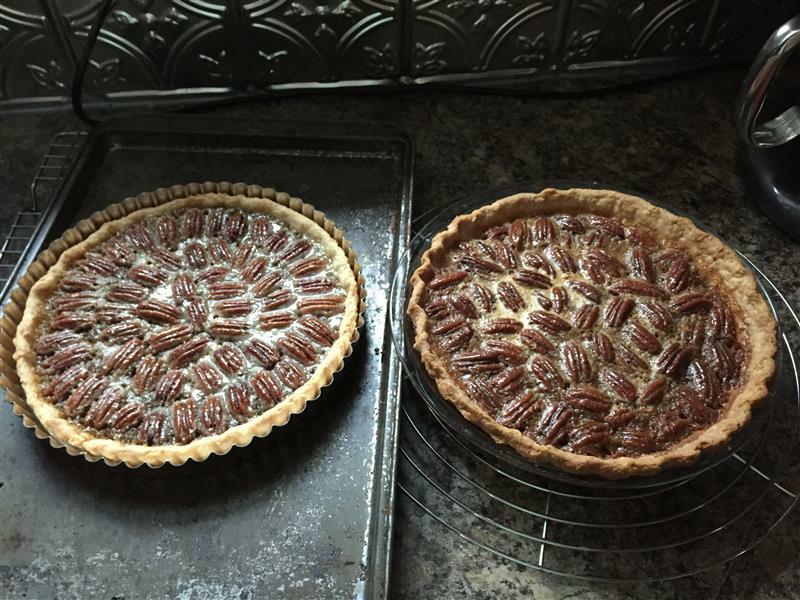 Was it one of the two pecan pies I made yesterday (one of which is for a friend’s son’s birthday, and the other because Jay wanted it)? 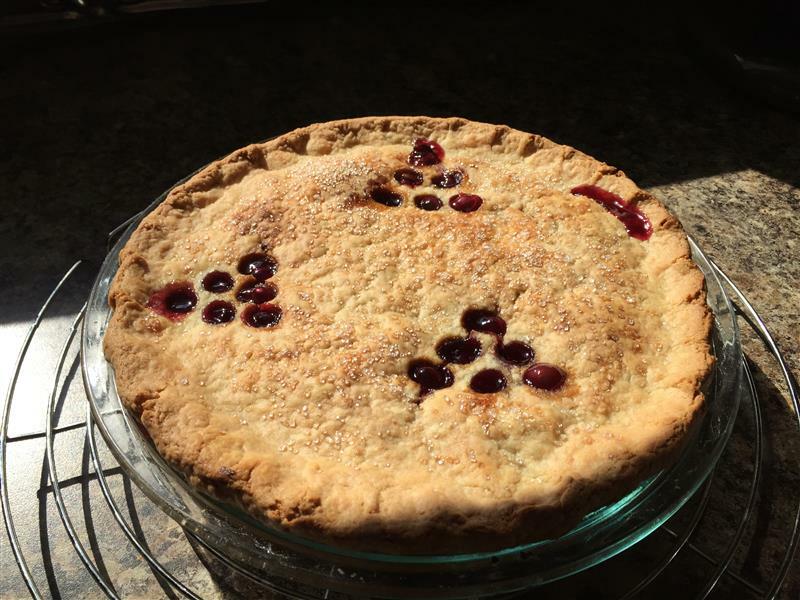 The grape pie I made on Sunday? Interior shot, just for Hanaâ. 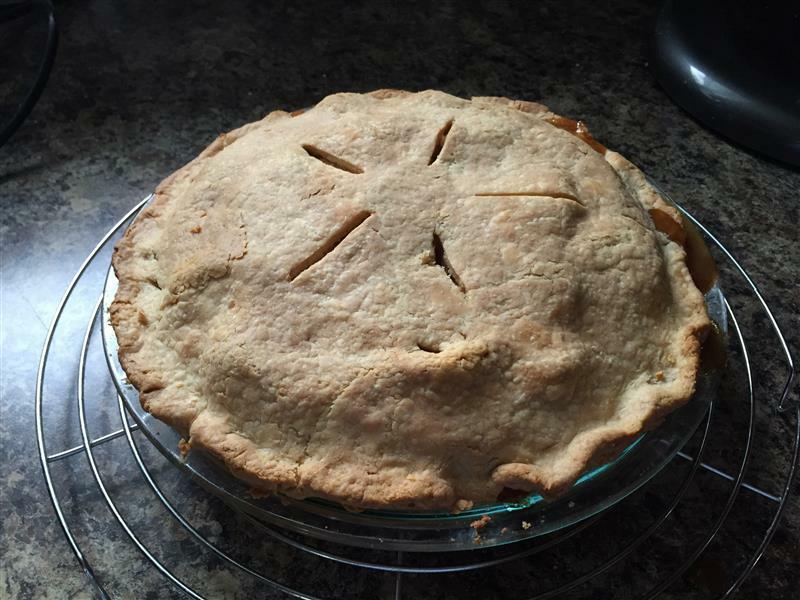 No, wait, it was the apple pie that I made on Saturday, and the “basic hearth bread” that I started on Friday and finished on Saturday. 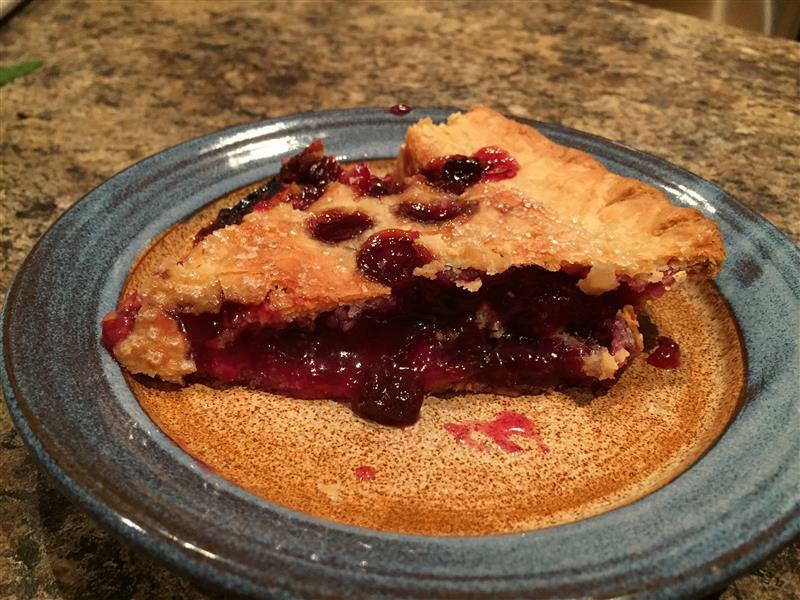 I’d like to say that the apple pie was as easy as pie, but it was honestly the most complicated fruit pie I think I’ve ever made, and that includes the grape pie (pictured above) where I had to squeeze each grape to pop the seeds out. 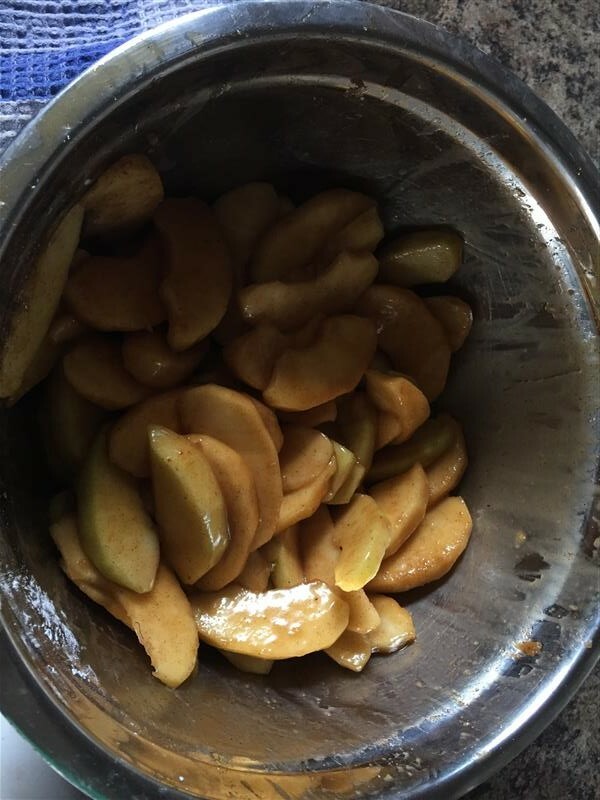 I’ve got apple pie filling that I make and can in the fall if it looks like I might find myself low over the next year. That one’s easy. Roll out the dough, dump in the (homemade) can of filling, and bake. 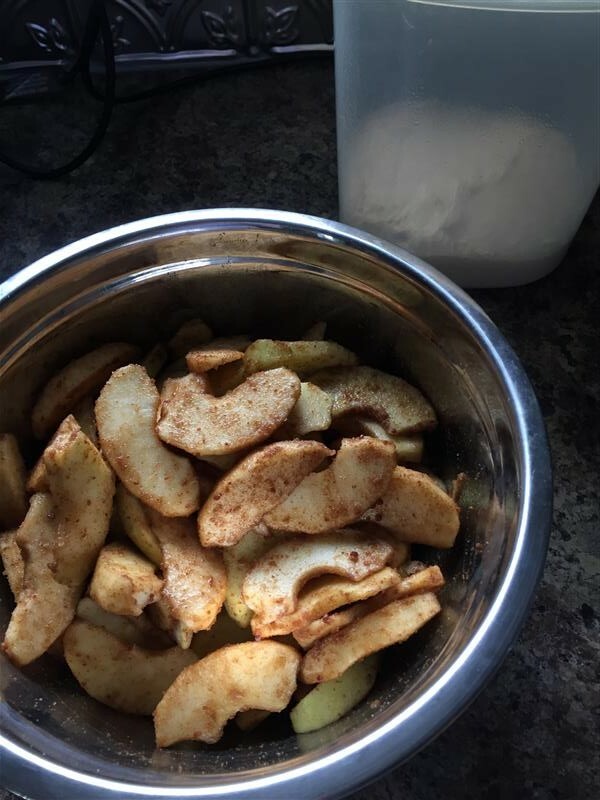 This one involved thickening apple cider with corn starch, sugaring & spicing the apples and letting them sit for a while to drain the liquids, the reducing that drained liquid down to a syrupy consistency before baking. There area some local apples available, but it’s early yet, and none of the “low water content” varieties that Rose listed in the recipe as favourites are available yet locally. 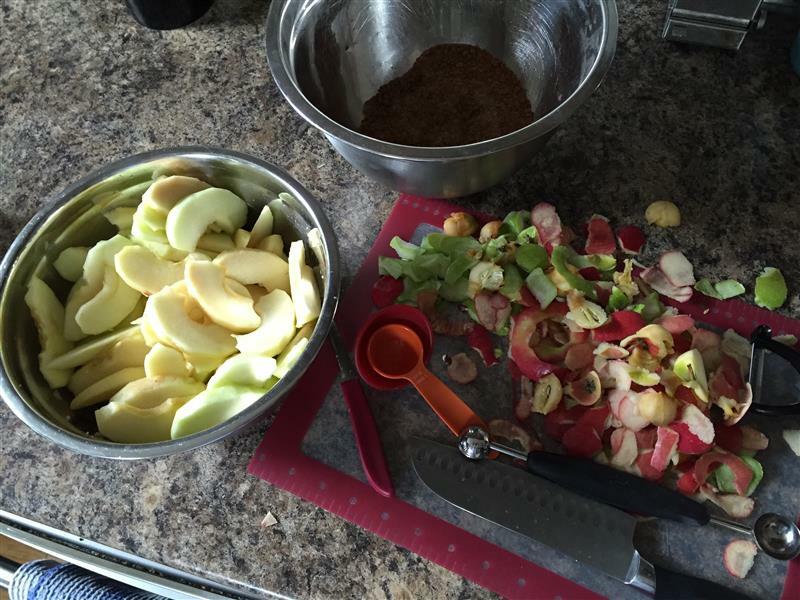 I played it safe and went with an imported combination of granny smith and pink lady apples. Cider wasn’t available, either, actually, so I watered down some cider that I had boiled into syrup last year (so I could make apple cider caramels). 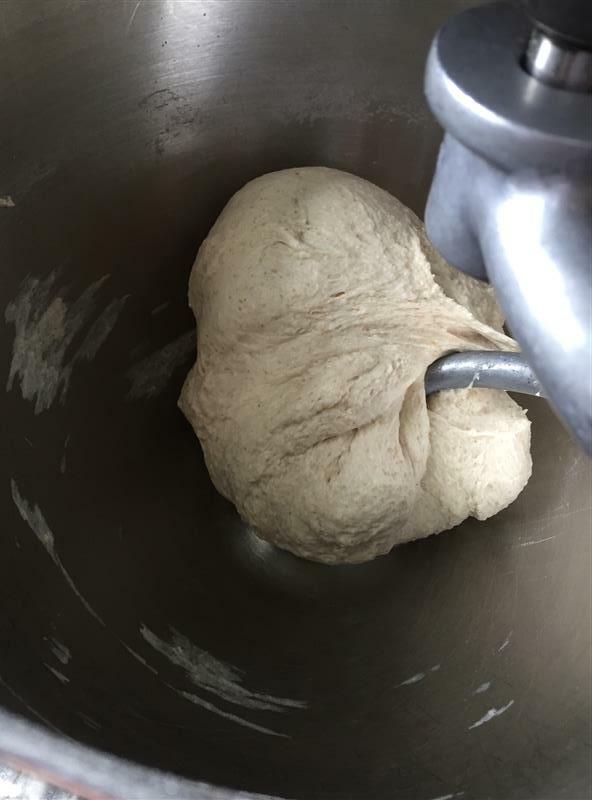 You can see my bread dough lurking in the background, here. 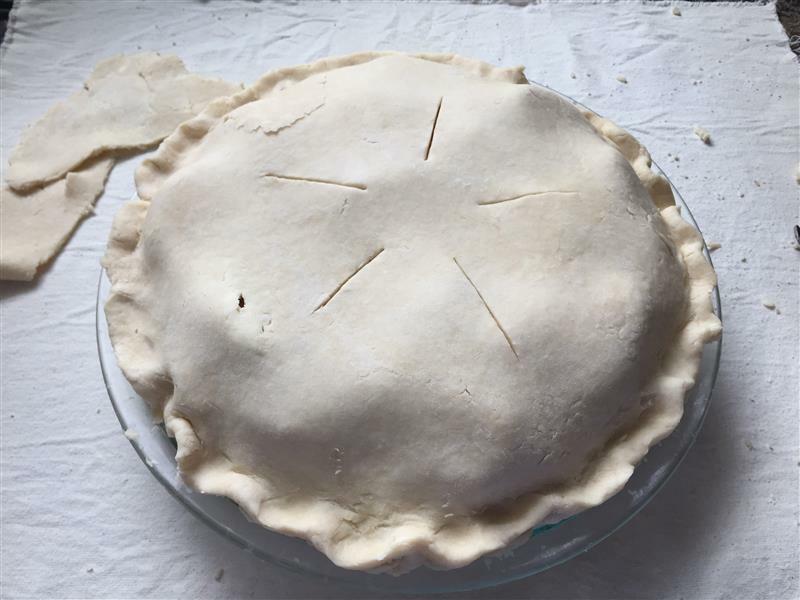 I thought at first that there was no way that all of the apples would fit into the pie, but I just stacked them up, put the top on, and pushed the slices toward the center as I crimped the border. The top crust did tear a bit, but that just makes it clear it’s home made, right? We went to our friends’ place for a BBQ on Saturday night, and I had agreed to bring dessert. Actually, when we asked what we could bring, I got a response of “Umm hello. Dessert ;-)” I am nothing if not an opportunist, so I also offered to bring some of my excess of tomatoes, turned into bruschetta topping, along with the basic hearth bread. Well, not all the flour. 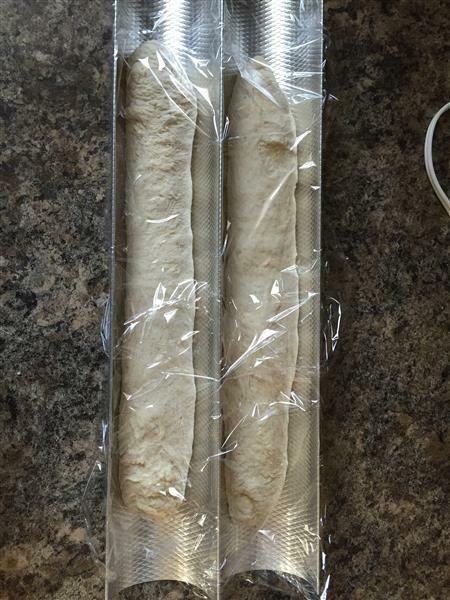 Just the 10% of the flour that’s whole wheat. As mentioned in the photo caption above, this bread has some honey in it. Wouldn’t it be awesome if the honey were also from my yard? I want one of these. 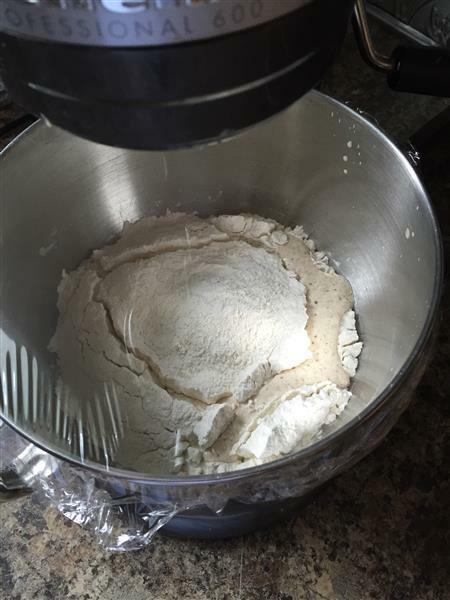 After mixing some of the flour & yeast with the wet ingredients, cover that mixture with the rest of the flour mixture. Let it sit and get active, and when it bubbles up through, you know it’s going to be tasty. Next, there’s a really critical step that I missed. And I don’t often have to do it with my normal bread pans, because they’ve developed a sort of seasoning like cast iron and are slick as any non-stick pan you can imagine. 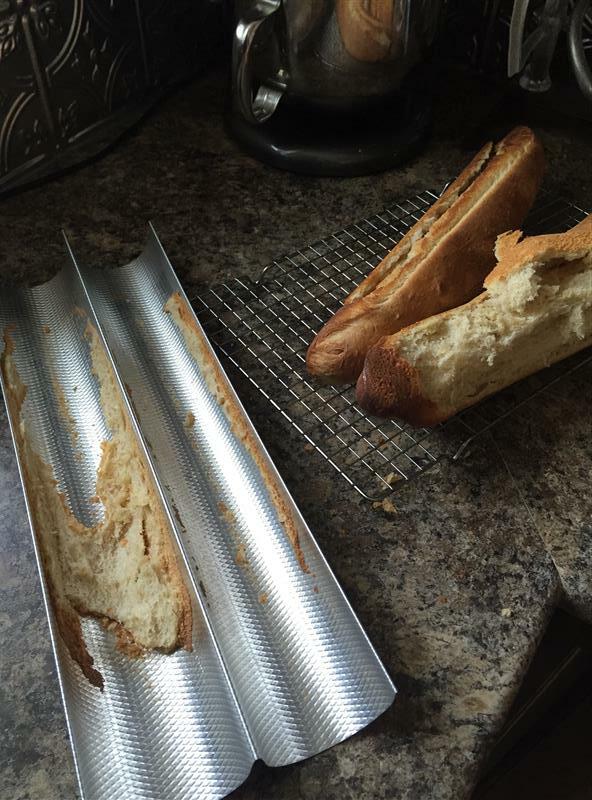 My baguette pans are not nearly as well used. I decided to bring the bottom crust that I had peeled off the pan with to our friends’. I figured it was a good way to deliver a lot of tasty tomato mixture to one’s mouth without a whole lot of bread. Fortunately, Megan agreed. 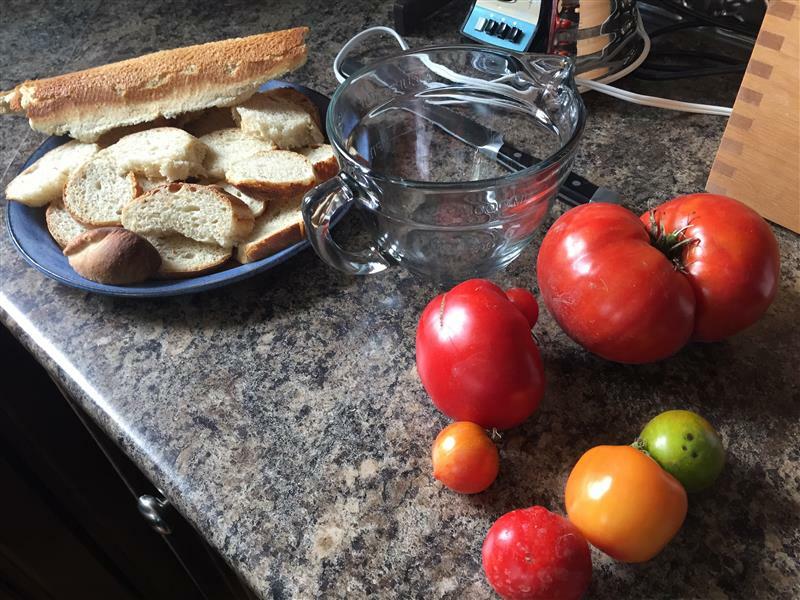 Doug said he didn’t know which he liked better – the bread or the tomato mixture. As for feedback on the apple pie, I think everyone enjoyed it. I certainly did. I did get one comment that the favourite part of my pies is the crust. And neither of the boys wanted apple pie. One just wanted ice cream, and the other decided, after trying the apple pie, that he wanted a pecan pie for his birthday. So, one of those went to the office today, to be sent home in preparation for birthday dinner tomorrow. Happy 10th, O.A.! 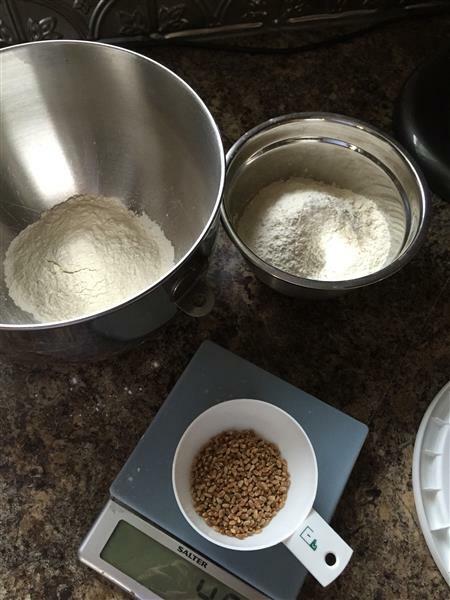 I was wondering how you could fit in so much baking when you then mentioned grinding your own flour! Everything looks perfect and delicious, including your tomatoes. You have lucky friends. How do I fit in so much baking? Easy, no kids. 😉 I choose to spoil my friends and their kids instead!